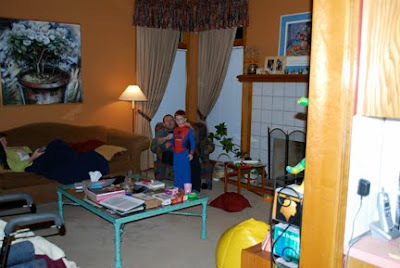 We built our house almost 20 years ago. The original carpet has been on the floor since then, until a few months ago. 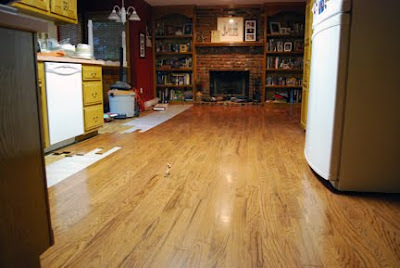 We even put carpet in the kitchen, because when we built the house we had to make sacrifices just to have a new house, and wood floors weren't in the budget. 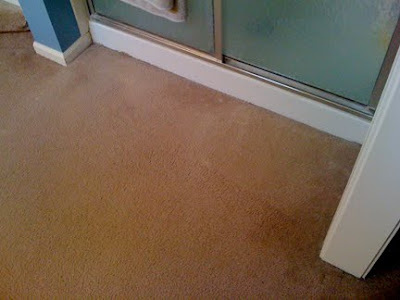 This particular home was being built at the time with carpet in the master bath—not a good place for carpet. 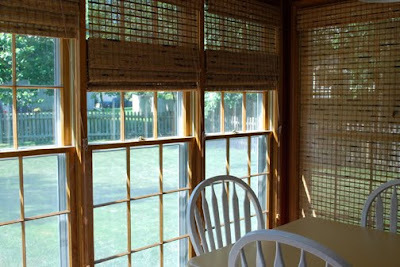 We replaced the dirty, white mini-blinds in the kitchen with bamboo shades. 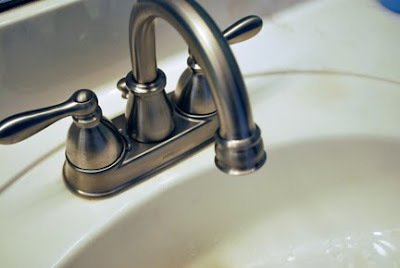 I love the warmth and texture they bring to the room. Finally we were able to make some improvements this past Summer and Fall. Having all the people in and out of the house was crazy, but definitely worth it in the end. 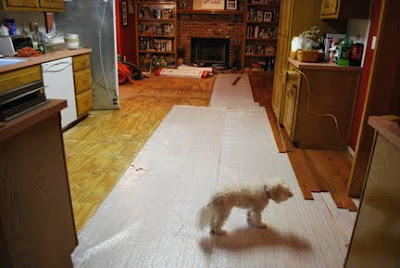 We had the 20 year old wallpaper stripped off the kitchen walls and had the kitchen painted a dark, cozy red. 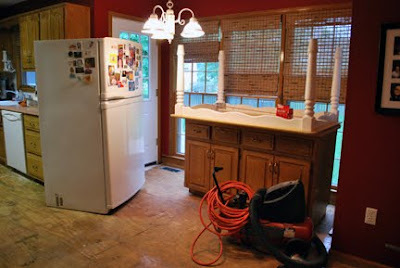 The yucky berber carpeting in the kitchen was pulled up, along with every other piece of carpeting in the house. 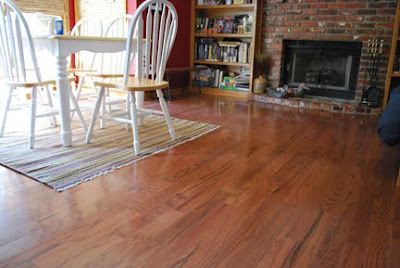 Engineered wood floors were laid in the kitchen (oh so beautiful!) 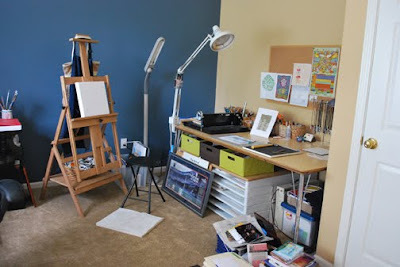 and a warm beige frisé carpeting went down throughout the house, while a low, dense loop was put down in the high traffic areas—stairs, hallway and my studio. 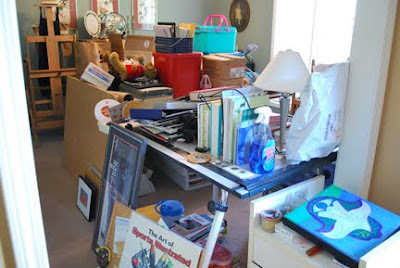 I had to move every single little thing out of that studio in order to have it done—no simple task. 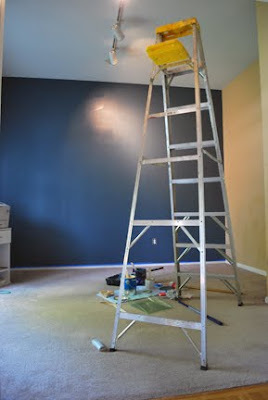 While it was empty I figured I might as well freshen up the paint and add a wall of color. All of this made it difficult to work for a bit (and blog, too!). 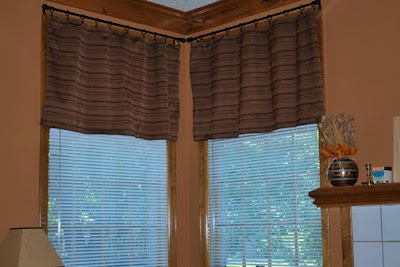 While we were at it, I decided to make new valances for our living room windows to replace the long, heavy curtains I'd made years ago. 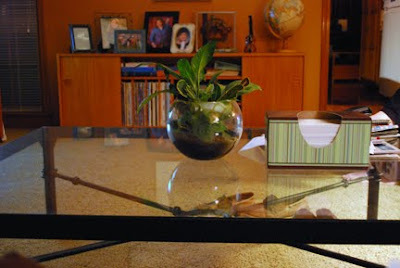 I also painted over the worn verdigris finished cocktail table in the living room with a updated matte black. 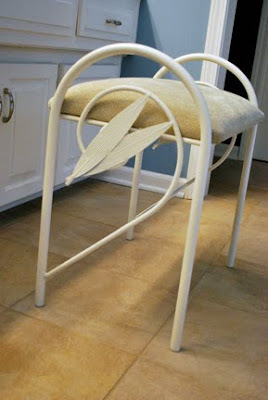 I painted the worn verdigris bench in the bathroom with a heirloom white and we had beautiful porcelain tile laid to replace the old, nasty carpeting. 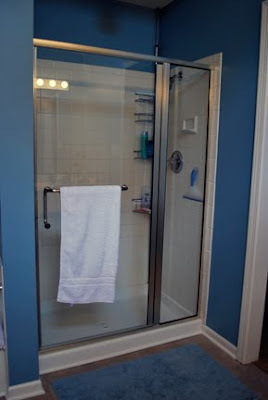 We even replaced the pan in the shower and had custom semi-frameless shower doors made. 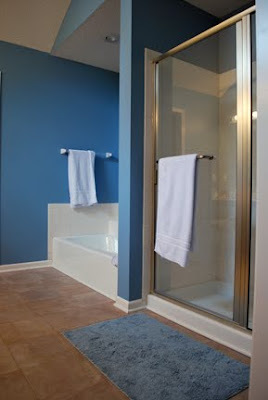 And, the peachy/apricot walls in the master bed and bath were painted over in soothing shades of blues. But the results are so worth the inconvenience, time and money. Our 20 year old house feels almost new. Next up: painting the dining room chandelier and powder room fixtures, new art prints for the living room walls.... Maybe next summer.